Brian McCarthy Contractors commenced the construction of this new convent building for the Sisters of the Ursuline Convent in Thurles, Co. Tipperary in late October. 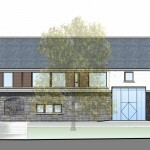 This new building, on the banks of the river Suir, will provide bedrooms, recreational areas, prayer rooms, offices and meeting rooms for the Sisters. The building is 1400m² over two storeys and the main features of the building will be an enclosed cloistered courtyard and an oratory which is a split circle on plan and which takes its roof profile from a parabolic curve. Work commenced on the site of the new PET Scanner building in October. 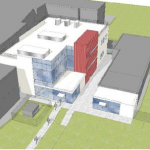 This project comprises the construction of a diagnostic and treatment facility for the Health Service Executive incorporating a PET scan unit to be located at Cork University Hospital. The works are being carried out within a live acute Hospital site and involve both phased possession and phased handovers.